Gold traded lower overnight in a range of $1307.80 - $1313.15, largely fading moves in the US dollar. The yellow metal softened to its $1307.80 low (2 week low) during late Asian hours as the DX firmed to 90.35, boosted by a weaker euro ($1.2290 - $1.2258). Later during European time, news that the UK and the EU agreed to terms for a 2-year Brexit transition period sent the pound ($1.3920 - $1.4088) soaring, and reports that ECB was reconsidering their easing path boosted the euro ($1.2325). 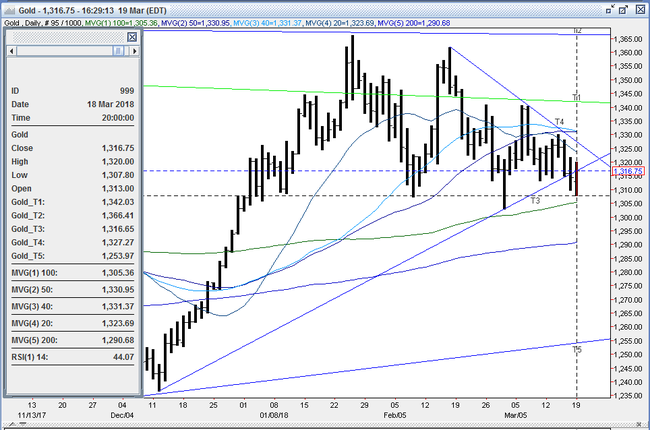 This knocked the DX back below 90 to 89.92, and lifted gold higher. The yellow metal rallied back to $1313.15, but was capped in front of the old support level of $1313-15. Weaker global equities were supportive of gold with the NIKKEI down 0.9%, the SCI up 0.4%, European markets were off from 0.7% - 1.3%, and S&P futures off 0.5%. A twitter tirade from Trump over the weekend regarding the Mueller investigation along with lower oil prices (WTI from $62.28 - $61.94, pullback from Friday’s strong rally after Saudi’s MBS said they would develop nukes if Iran did) weighed on stocks. A weak opening for US stocks (S&P -22 to 2729, Facebook clobbered on data breach, tech leads decliners) helped reverse a modest bounce in the dollar (DX back under 90 to 89.95), but the greenback held its previous low. 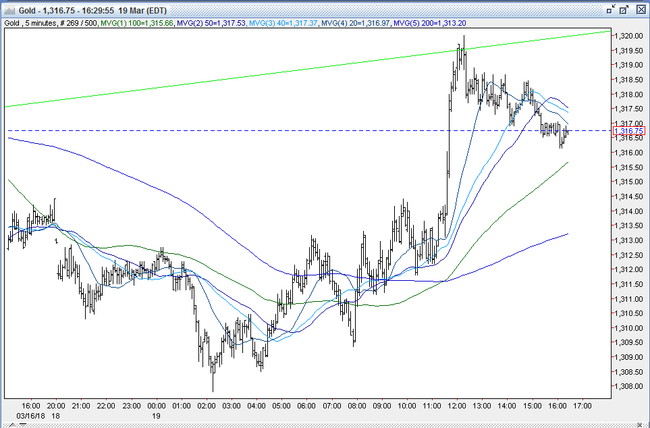 Gold probed higher, and reached $1314.40. From the late morning and into the afternoon, US equity losses accelerated (S&P -59 to 2693). The 10-year bond yield dipped from 2.88% - 2.833% on a flight to safety, and the DX made a fresh low at 89.76. Gold took out resistance at the $1313-15 former support level and $1317 (up trend line from 12/12 $1236 low) and climbed to $1320, with a fair amount of short covering seen. Late in the session, US equities came off of their lows (S&P finished -40 to 2712, holds key 2700 level), and the 10-year yield ticked back up to 2.855%. The DX clawed back to 89.91, and gold drifted back to $1316.50. It was $1317 bid at 4PM with a gain of $3. Open interest was off 8.8k contracts, showing a net of long liquidation from Friday’s dip. Volume was higher with 322k contracts trading. The CFTC’s Commitment of Traders Report as of 3/13/18 showed the large funds cutting 11.1k contracts of longs and adding 4.7k contracts of shorts (largely on the dip to $1313 last week) to trim their net long position to 168k contracts. Since the report, around 15k more net longs have been reduced, taking the current net fund long position to around 155k contracts – the lowest level it has been since 12/26. While this certainly does no favors for bullish market sentiment, the reduction in gross fund longs takes away liquidating selling pressure, and the addition of gross fund shorts sets the market up better to advance from potential future short covering. While bulls will take today’s gain, they were a bit disappointed that gold only advanced $3 while the DX traded below 90, the S&P lost 40, and the US 10-year bond yield traded below 2.85%. However, they maintain that the dollar’s recent bounce from the 2/16 3-year low at 88.25 is only a minor correction within its year-old downtrend, and expect a retest of that level to drive gold higher. Bulls will need to overcome initial resistance at the $1320-22 double top to be able to challenge the down trendline from the $1362 high from 2/16 at $1327 followed by the $1328 -30 – quadruple top (3/8, 3/13, 3/14 ,and 3/15 highs). Above here, they see a vacuum up to the triple top at $1341. Bears remain comfortable selling into rallies, and expect renewed strength in equities, higher bond yields and a continued bounce from the 88.25 low in the DX to pressure gold lower. They will look for a breach below support at the double bottom at $1308-10 to bring into play key support at $1303-05 (100-day moving average, 50% retracement of up move from 12/12/17 $1236 low to 1/25/18 $1366 high,3/1 low). Below here, bears expect further long liquidation to lead to a test of the 200-day moving average at $1290. All markets will continue to focus on the volatility in the equity and bond markets, geopolitical events, developments with the Trump Administration (especially tariffs/dismissals), oil prices, and will turn to reports tomorrow on Japan’s Machine Tool Orders and Leading Index, German PPI and ZEW, Eurozone ZEW and Consumer Confidence, UK CPI, and any potential news coming from the G20 Meeting in Buenos Aires for near-term direction. Looming ahead Wednesday is the FOMC meeting along with Powell’s first press conference as Fed Chair. Gold at lowest year to date – will it stay there?